Thanks to the L2R community, they were able to come up with the best method to level from 1 to 100+. You can check out the document here. Below is a quick guide on things you should be doing for the game at various stages in the game. Do story quests until lvl 31. If stuck, do Tower of Insolence, Daily and Weekly quest. 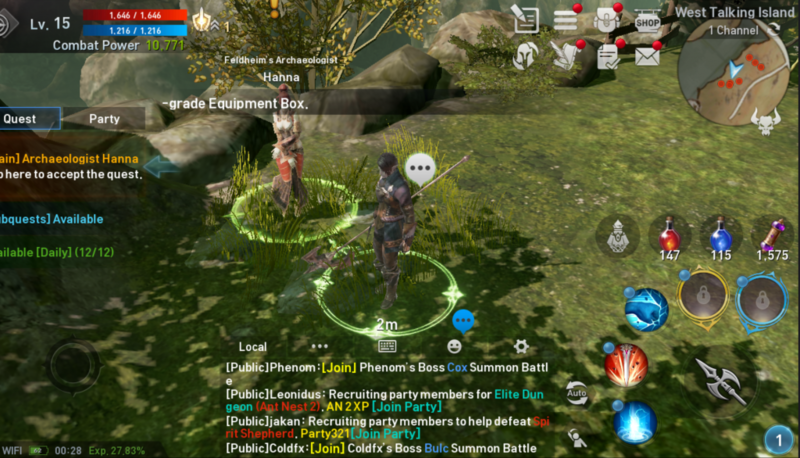 Party grind Elite during HOTTIME if possible, choices available are Drill Bat (Elven 1) and Spartoi Hunter (Elven 2). Grind at Turek Orc Trooper/Turek Orc Shooter. Party grind at Elite during HOT TIME, best choice is Ant Soldier Larva (Ant 1). Grind at Wasteland Basilisk/Sahara of the Desert/Mutant Armor Ant. Party grind at Elite during HOT TIME, best choice is Ant Captain but Ant Soldier Larva (Ant Catacomb 1) would do fine for core farming. Grind at Breka Orc Infiltrator/Breka Orc Ranger/Leto Lizardman Shaman in party. Party grind at Elite during HOT TIME, any elite in Ant Nest Catacomb 2, preferably Ant Noble. Below are some tips you should use to help you get to higher levels smoothly. Use rubies for Daily Scroll (only A but any level scroll) reset (50rubies for 5 scrolls, up to 3 = 15+5runs a day) for maximum value, only farm Daily Scroll and not buy unless you want fast experience but beware of CP deficit. Balance out equipment CP value and avoid focusing on one piece of equipment to SR unless fully geared. All field monster may drop Quest Scroll A/B/C, Upgrade Stones, Enhancement Scrolls, Maphr’s Protection, Elixirs. Sell tradable Upgrade Stones and Enhancement scrolls gotten from grinding if F2P to buy rares from Trading Post. Rubies use for endgame substat reset and reset HOTTIME/Daily to speed up progression and more upgrade stones. Party to farm cores will be faster than solo auto due to area coverage and more monster killed compared to solo. Get all new rune pages to lvl 1 before going back and maxing the rune. Every 10 levels unlock a rune page. Below are some tips on equipment and item usage. Only use Upgrade Stones for Rares and R to SR upgrade on normal EQS. Use combine for others. Enhance normal equipment until +5 max and save the rest for rares. Equipment only combine grade A+A>S, grade S+S>R but not R+R>SR as it would be expensive, use R+upgrade stones to SR if possible. When everything SR lvl 30 then aim for S rare pieces *Full set of R lv30 works too. Plan out what accessory set you want to go and focus on getting a set of SR accessory of your choice. Enhance rares to +10 as bare minimum as +10 wouldn’t drop to +9 if fail, same as +20 and +30. Varnish selectors (B/A/S) from equipment dungeon, only select Accessory Varnish B/A/S. Only use Soulshots for Bosses. If manual play in field monster, enter and exit elite for full HP MP refill. Upgrade = Obtain the same equipment of a higher grade. Upgrade is cheaper than combining by around 50% but takes weeks to obtain required amount of Upgrade Stones. Upgrade is preferably used for R to SR (reduces cost by around 500k) or S rare to R rare to SR rare. Upgrade requires 10 Upgrade Stones for A>S, 20 for S>R, 30 for R>SR, same amount for all weapon/equipment/accessory. Combine -> Obtain a random equipment of a higher grade. Combine is more expensive than upgrade, almost double if not double. Combine is mostly used for getting rares, combining 2 A-grade lvl 30s for a chance of S-grade rare (rare equipment starts at S). Combine is preferably used for A to S, S to R but not R to SR due to the cost difference and difficulty of getting a R-grade equipment through 10+1 summon. During combining, the equipment on the left (initial selection) will keep all it’s properties* and soul crystals while the equipment on the right (second selection) will disappear as fodder/material. Check out our Monster Core guide too!